It might sound impossible but we now have the technology to produce beautiful aesthetic crowns in one visit instead of the traditional 2 visits. This state of the art technology uses milling to produce a crown, inlay or overlay (partial crowns). 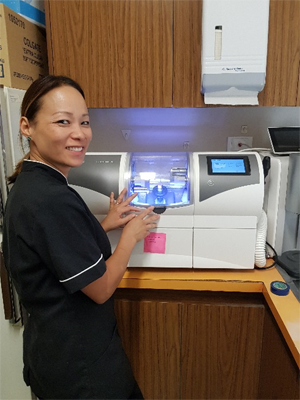 Whilst patients still need to have the numbing and the drilling , there’s no need for the mouthful of impression material which so many people dislike and no need to wait 3 weeks with a temporary filling. After the initial consultation which usually involves a thorough examination, x-rays and tests, a computerised camera captures the area to be treated. 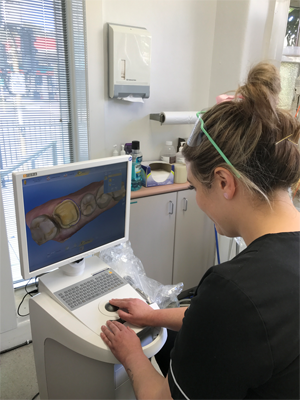 The tooth is then prepared and further scanning with the camera is performed. The computer and milling system then produces the crown on a virtual model of the mouth to create a ceramic crown. The new crown is then delivered to the mouth. The whole process takes about 2 hours which includes a nice break (perhaps enjoying a beautiful Map coffee) in the middle of the appointment when the machine makes the crown. What are the advantages for me as a patient? Just imagine not having a mouth-full of impression material, only being numb once instead of twice, only having one visit instead of 2 and not having the discomfort of a temporary crown.